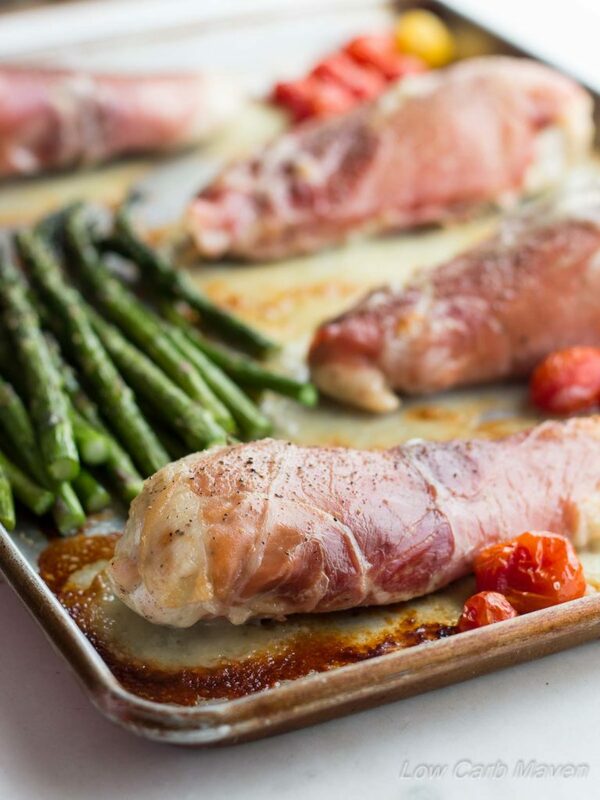 This prosciutto wrapped sheet pan chicken recipe promises a tender, moist, flavorful chicken dinner with minimal time or effort. I know… I know… I’m late to the party! I’m late to the sheet pan dinner party. You know, where you cook an entire dinner on a sheet pan in the oven? Yeah, I just arrived, but I’m really into this party and I’m not ready to leave! I saw some great sheet pan dinners in a magazine early last Fall, but my mind was on other things and I never got around to making any of the great chicken sheet pan recipes until recently. 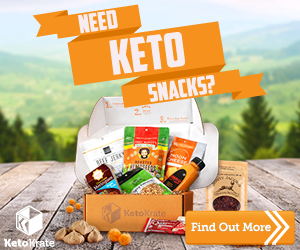 Not until I started working on my first ever sponsored post – which was for Atkins Nutritionals by the way (yes, I ‘m very proud). I experimented with a catfish sheet pan dinner and several baked salmon recipes but ended up doing a ham and smoked mozzarella hasselback chicken recipe instead. Ahhh, chicken. I love chicken and I could eat chicken for lunch or dinner almost every day. I think the appeal lies in the fact that it’s neutral taste just begs for fancying-up! You can do almost anything with chicken! But this time I opted for a simple and classic flavoring combo: prosciutto, Dijon mustard, and provolone cheese. It’s super easy to make and I’m all about that these days. Spread mustard on the chicken. 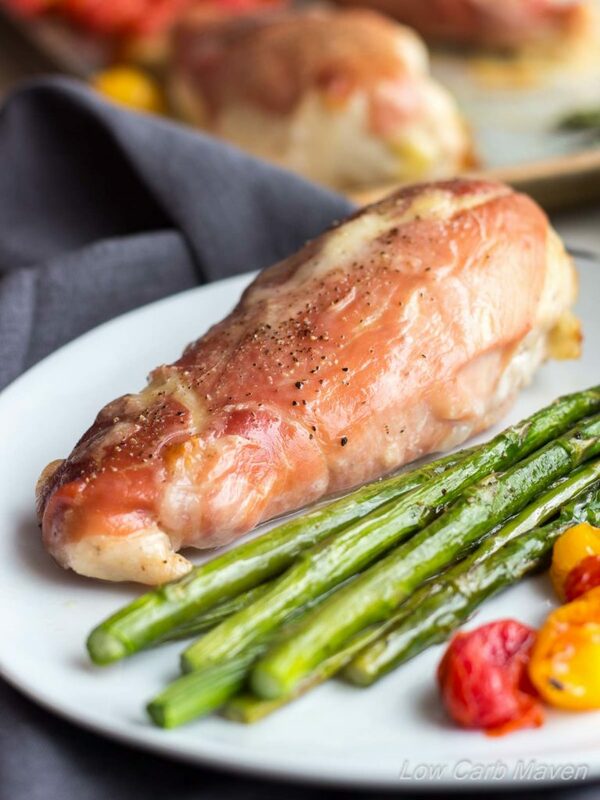 You could use any vegetable combination to accompany this prosciutto wrapped chicken but I chose asparagus and tomatoes. Have I ever told you that asparagus is not my husband’s favorite vegetable? Nope, it’s not his favorite and I’ve used asparagus on our sheet pan dinners quite a lot in the last few weeks. He cornered me in the kitchen the other night and flat out let me know that he noticed that “we’ve been having an awful lot of asparagus lately.”Oops! Sorry, Honey! 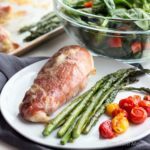 What I like about this prosciutto wrapped chicken recipe is not only its classic flavor but that it can be ready in 30 minutes. The chicken bakes up super juicy and full of flavor. And oven roasted vegetables are always great. You know, for extra flavor and to be extra fancy you could make a balsamic reduction and drizzle that over the chicken or the vegetables. It’s simple! Put 1/2 cup of balsamic vinegar in a small sauce pan and simmer until about 2 tablespoons are left. Then cool. This concentrates the naturally occurring sugars in the vinegar, so use just a tiny bit on your food. It’s amazing! TIP: I wrapped the chicken the night before and parked it in the fridge, removing 30 minutes before cooking. I also trimmed the asparagus the night before so all I had to do was toss it with the olive oil and vinegar and lay it on the sheet pan just before popping in the oven. If you’re like my husband and asparagus isn’t your favorite vegetable, try green beans. Don’t like cherry tomatoes? Try subbing quartered button mushrooms. Looking for other sheet pan meals? 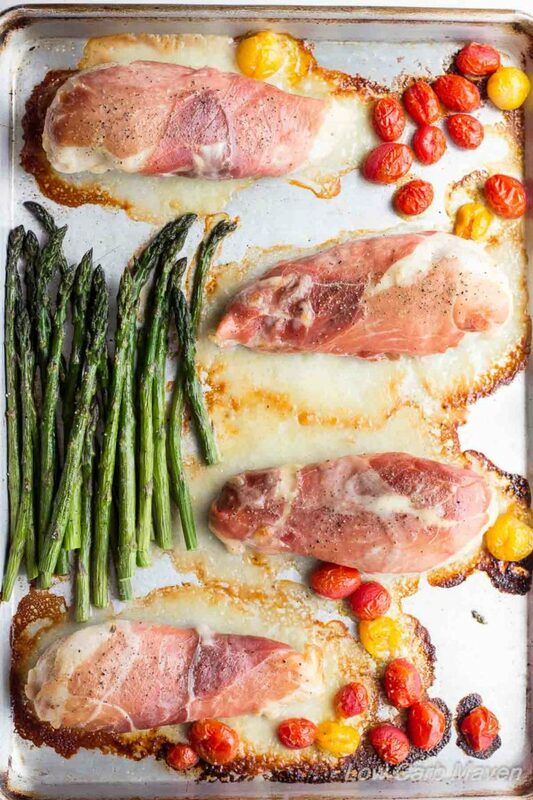 Try the Hassleback Chicken Sheet Pan recipe. 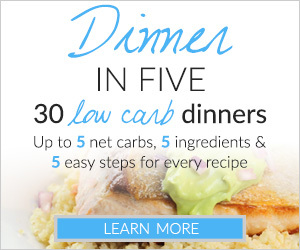 Hey, at just 4 net carbs for this dinner you have room for dessert! What about these? 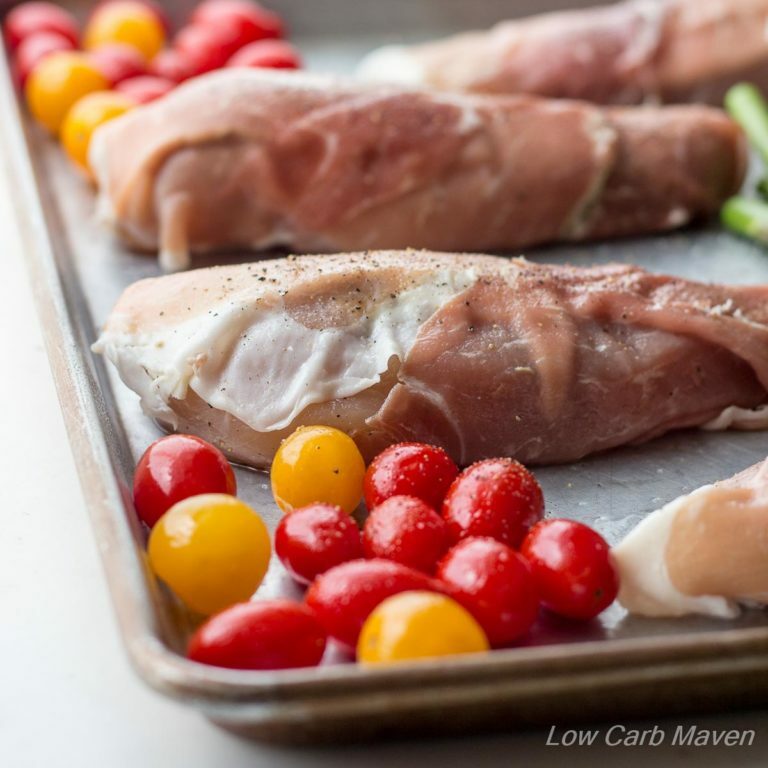 This Prosciutto Wrapped Chicken is 4 net carbs per serving! NOTE: The chicken can be prepared the night before and refrigerated. Let it sit on the counter for about 30 minutes before cooking. Prepare: Preheat the oven to 425F and adjust the oven rack to the middle position. Line a sheet pan with aluminum foil or parchment paper. If using aluminum foil, give it a spray with baking spray. Trim asparagus. Mince the garlic and place into a small bowl. Add the vinegar, oil, 1/4 teaspoon salt and 1/8 teaspoon pepper. Chicken: Pat the chicken breasts dry and season well with salt and pepper. Spread each breast with 1 teaspoon of Dijon mustard. Lay two pieces of Prosciutto on the work surface, overlapping just a little. Place three pieces of cheese down the middle of the prosciutto. Place a chicken breast, mustard side down, on top of the cheese and wrap the prosciutto around the chicken. Place on the sheet pan seam side down. Vegetables: Pour the vegetable marinade over the asparagus and toss to coat. Place the asparagus on the sheet pan. Put the tomatoes into the bowl and swirl them around to coat them in the remaining marinade. Place them on the sheet pan. Cook: Roast the chicken in the oven for 20-30 minutes depending on how thick and cold your chicken is. If the asparagus is thin, it may need to be removed before the chicken is done. Portion: Plate one prosciutto wrapped chicken breast per person and divide the vegetables evenly. Previous Post: « Martina’s Amazing Fudgy Keto Brownies! I’ve had this one tabbed for quite some time now and finally got around to making it tonight. I bought the chicken, prosciutto, and vegetables, but completely forgot the cheese, so had to use what I had on had, which was pepper jack. I wasn’t so sure how it would turn out, but it was great! I butterflied my chicken breasts, spread with mustard and put the cheese in the center, folded over and salted and peppered generously before wrapping with prosciutto. I stuck with asparagus and tomatoes for my veggies, but also had a crown of broccoli that didn’t get used (left over from the other night), so I threw that into the mix. Wonderful! All of it! Super easy, super quick. And I lined my pan with parchment paper, so clean up was a snap, too. Thank you for another great recipe! My kids RAVED about this! Thank you! Six months ago neither touched mustard. I pounded the chicken breasts thin, cut in half and added baby spinach under the cheese (one slice). I roasted Brussels sprouts, shallots and onions since that is what I had on hand. I had made bacon to add to Brussels so cooked the veggies and chicken in its grease. YUM. Time to go to the gym now. Haha! Instead of putting the meat and veggies directly on the baking sheet under direct heat, which can dry them out, I wrap up the meat and veggies together, in single serving sizes, on parchment paper, crimping all of the open sides to seal the serving so it bakes in the sealed parchment, preserving the juices and tenderness. And the big benefit?…easy clean up! 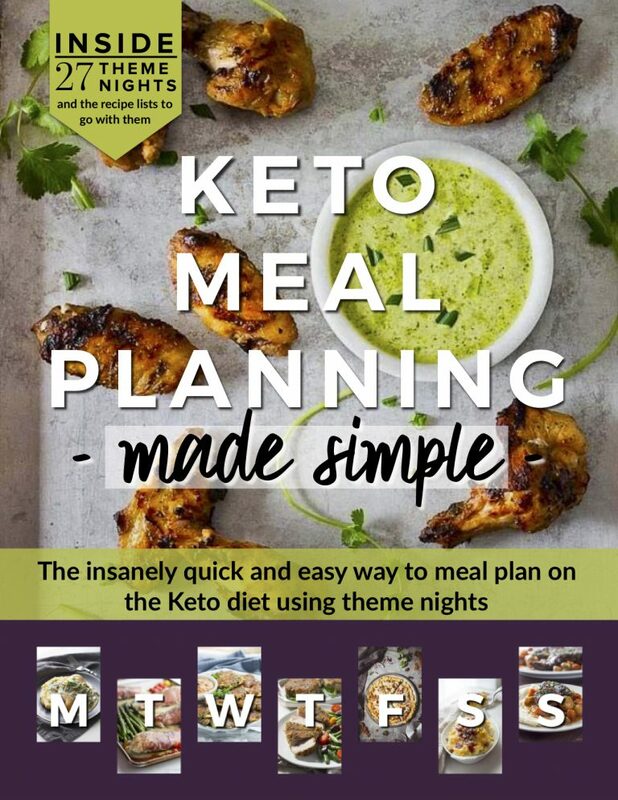 Love this idea for a simple low carb meal during the week! Only made the chicken but, “wow!” that was a winner. Could only find the prosciutto in 3oz packages so I bought 2 and went for 3 slices per serving. Also came to find I was out of Dijon (how does THAT happen?!) so used garlic infused whole grain mustard. So good and so simple yet classy. 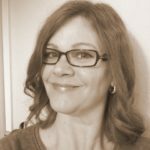 Awesome – thank you! Looks so simple and appealing. Must rush to the store to get my ingredients. Thanks for sharing. This looks like a dish packed full of flavor! I haven’t made it to the party yet….save a place for me! I need to start doing sheet pan dinners. This looks like a great one to start with.